As you may have read in the Sennheiser GSP 500 review, I have been going through a lot of changes in the recent months. The next big change has been related to my career. I have actually been looking for a new position for a while. We had gone through a few personnel changes at work, leaving me with a lot of growth opportunities without any mentors. One might think this is a really good thing, but I think I am still young as a developer and need people with more experience above me. During my search period, I worked with a headhunter to help me with finding different prospects and they showed me a lot of different companies I had no idea existed in Calgary. Ultimately, I ended up going with a different company altogether, but I was very appreciative of the things they helped me learn along the way. The biggest among those learning moments was the fact I was totally out of shape for interviews. Interviews seemingly are a balance game of showing you are capable and showing you are willing to learn more. As software development is very much a team thing nowadays with the need for collaboration, you need to be confident in your own skills, but also be willing to work with others, whether they are much more or much less knowledgeable. Today's review unit of the SteelSeries Arctis Pro + GameDAC is from their newest lineup of gaming headsets. Unlike me and my software experience, SteelSeries has been developing headsets for a while, dating all the way back to their original Siberia days. Clearly, they have the confidence to show their prowess and abilities in this market space, so what do we have today? We will see, so read on to find out! 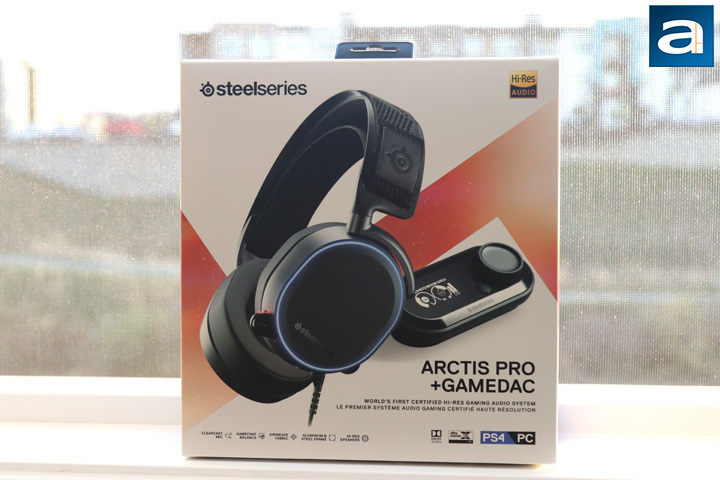 Today's review unit of the SteelSeries Arctis Pro + GameDAC arrived from SteelSeries' marketing agency in Miami, Florida. Traveling from the sunny state to our APH Networks location in Calgary, Alberta, this box shipped to us via UPS Standard. 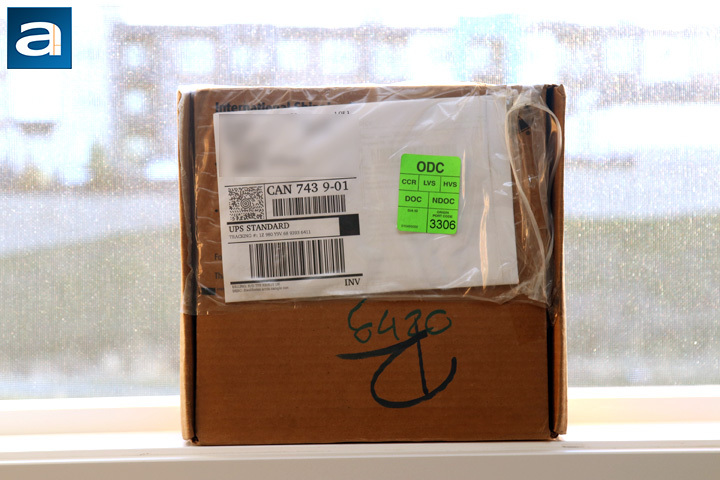 It arrived in a brown corrugated cardboard box with little to no damage to speak about. This was the only product inside the box, and it was protected nicely by some plastic pockets of air to prevent any impact damage to the contents. Otherwise, I think I am more interested in the product inside than the box, so let us carry on. SteelSeries' colors have always been a black and orange affair, but they seem to be moving away from that, at least with the Arctis Pro + GameDAC container. This retail box keeps their orange flair combined with a white backdrop. If you shine the box in the light, you will see this orange area actually sparkles and disperses light like a foil finish found on holograph cards. As you can see, the headset is displayed in all of its glory, with the included digital to audio converter next to it. The company logo and name can be found on the top left corner, with a product description of "World's First Certified Hi-Res Gaming Audio System". A "Hi-Res Audio" certification can be found on the top right corner. In the bottom left side, we have some key features to speak about with some more specifications on the bottom right side. Flipping the box around, we have some other lists of features and specifications of the Arctis Pro + GameDAC. Otherwise, I find the packaging to be clean and straightforward. To get to the items inside, you will just need to cut some seals on the side and lift the top off. 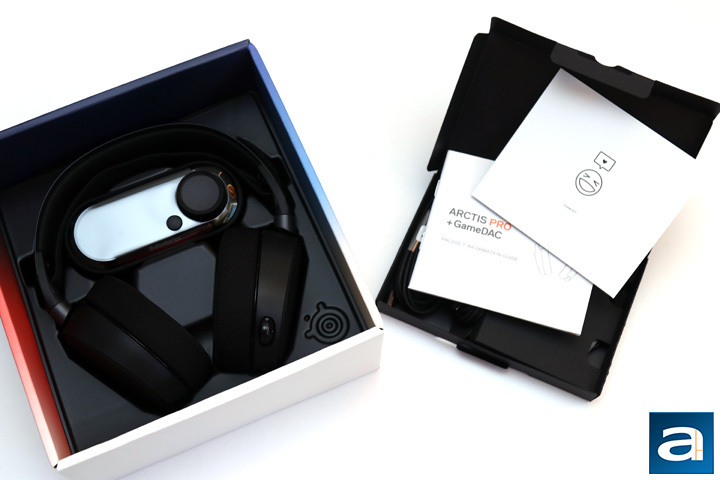 Inside the retail box, the SteelSeries Arctis Pro + GameDAC can be found placed on a plastic shell. To simplify things going forward, I will refer to the headset as the Arctis Pro and the external controller as the GameDAC. In addition to the main points of attraction, you will also get several cables, including a headset cable, USB audio cable, Toslink optical cable, four-pole 3.5mm adapter, and a microphone windscreen. In addition, you will get a small information guide going over the basic use cases of the headset and some warranty and contact information. One thing I have complained about in the past and I will continue to do so is the length of the warranty period with SteelSeries products. While I am used to seeing at least two years of coverage, SteelSeries only covers their products for a single year in the North America, which is quite disappointing. Maybe one day they will hear my cries and answer me, but until then, I will just have to deal with it.